In many circumstances, to be tolerant is seen as a virtue. And certainly, when aspiring to greater open-mindedness and diversity, it is. But when it comes to culture management, the act of tolerating becomes far more insidious. What you tolerate will always become the lowest common denominator in your organization. It will determine the culture you create around you. Tolerate mediocrity–or worse–and that is what you will end up with. 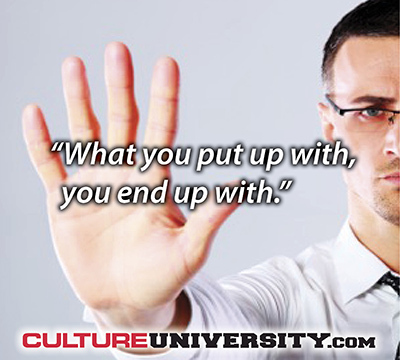 Walk past point-scoring, blame, or arrogance, and they will become prevalent in your culture. Master the art of not tolerating such things, and you will witness rapid culture change. Simply choosing the behaviors you want to eliminate from your culture and focusing relentlessly on not tolerating them should be fairly straightforward, right? But this process hits at the heart of something most of us would prefer to avoid – the difficult conversation. It’s so much easier to say nothing, especially when performance numbers are good. It takes courage to speak up, but it becomes easier when those at the top are clear on the standards and values they expect within their culture. When former Toshiba Corp chief executive and president Hisao Tanaka was forced to resign last year due to an accounting scandal, it emerged that Tanaka himself was aware of the financial malpractice that had been going on for years. He also knew that the culture was such that employees were too afraid to question it. By ignoring this from the first moment he had an inkling of bad practice, Tanaka tolerated the issue, allowing it to snowball. We all enjoy focusing on strengths encouraging good behaviors. And although beneficial, I’ve found that encouraging and discouraging is not enough. Calling out behavior that doesn’t meet the standard is a fundamental part of leading culture. Each time a leader sees an unsafe practice, for example, and does not point it out, they are sending the message that the behavior is tolerated. In this instance, the impact of neither encouraging or discouraging a behavior can have disastrous, even life-threatening consequences. Tolerating becomes even more tempting when pressure gets applied. Let’s say collaboration is a cornerstone of the culture you need to create success. Someone delivers a difficult project on time, but has skipped key collaborative components in order to achieve this. What do you do? When do you tolerate low collaboration in the name of short-term deliverables? And when do you not? There are many things a leader has to focus on if they want to change culture. Walking their own talk and modeling the behavior they want; selecting good culture metrics and holding others to them; painting a picture of the desired future culture and communicating it whenever possible; assigning resources to building the skills and infrastructure that will support the desired behaviors. But if you asked me to pick one thing, it would be this: learn to be intolerant in all the right places. Boards have long tolerated a whole range of behaviors, simply by not paying attention to behavior at all. Up until very recently, boards of directors considered behavior as a topic for management, rather than directors. Even now, many boards are motivated by pressure from regulators, rather than by a deep-seated belief that behavior is as much a part of performance as financial measures. But boards today can actively show their lack of tolerance for certain behaviors. They can request data on key behavioral metrics, or on factors such as how strongly behavior is considered in performance review, or how often behavior is a cause for promotion, reward or dismissal. And what if you’re an employee whose span of influence is seemingly quite small? What behaviors do you tolerate in yourself? In your colleagues? Do you care enough about certain behavioral standards to find a way to point out behaviors that do not meet them? Do you take time review your own behavior? Everyone can make a difference here. These days, so much energy and investment goes into all of the trappings of building the best culture – the values statements, roadshows, lists of behaviors and metrics. But then every day, certain behaviors get quietly tolerated, and much hoped for traction isn’t achieved. In the end, it comes down to what happens in the day-to-day. What choices do people make at any given moment? What behaviors do they think they can get away with? And does the culture support those who choose not to tolerate those behaviors? As the saying goes: What you put up with, you end up with. Or, in culture management terms: what you tolerate becomes the cultural norm. So what are you willing to put up with? What did you tolerate today, which, if you had not, would have sent a stronger signal about the behaviors you want around you? I welcome your comments on social media.